Mondays and Thursdays 6-7pm (U.S. Mountain Daylight Time). See CANVAS for the Zoom meeting information. If the office hour times do not work for your schedule, please contact me to schedule a time that does work. Write code to process data using the Python programming language. Design and write a basic algorithm to solve a scientific challenge or process data. Write well documented, modular code to support open science workflows. Use Git/Github.com to track chances in your code and collaborate with interdisciplinary colleagues. Use Shell to interact with Git and to create and interact with directories and files. Organize documents and directories using sound data management approaches. All students need a working laptop to use in class each day. The tools used in this course need to be installed on the laptop before the course begins. Students can follow the instructions on Setting up Git, Bash, and Anaconda on your computer to install the necessary tools for your operating system (Windows, Mac, Linux). If you enrolled in the online section of this course, you can join the course remotely using Zoom. Zoom information will be provided to you on or prior to (if you are an online student) the first day of class. The Zoom recordings can be accessed by all students in this course via CANVAS, the university learning management system. Ask questions during hands-on exercises in class. Post your question on the Piazza webpage for this course. Read more about how to use Piazza lower down on this page. There is no required textbook for this course. You will learn about each topic taught in the course from a suite of daily hands-on exercises, presentations, blog posts, texts and other resources throughout the course. As you find other resources that help you through the class, please feel free to share them with the instructor and your classmates through Piazza. This introductory, multidisciplinary course will provide core scientific programming skills required to efficiently work with a suite of earth systems data in Python. Write modular code using Python to process and visualize different types of data. Use version control to backup and track changes to code. Use Shell to access Git (version control) at the command line and to create and organize directories. You will also learn how to work collaboratively with colleagues using Git and Github. This course is technical. You will use the Python programming environment and the Jupyter Notebook interface to work with data. You will code every day! No programming experience is required to take this course. The course format is a condensed to 3 weeks following the CU Augmester schedule. The following topics will be presented over the course of that time. Use Git and Github.com to track changes to text files and code. Introduction to Jupyter Notebook and the Python programming language. Write modular efficient code in Python using functions and loops. The course will culminate with a project rather than a final exam. All grading for this course will follow the CU grading policies. Late assignments are not be accepted in this course. If there are extenuating / university approved circumstances university-approved activity, illness, injury, family emergency, or religious observance that prevents you from completing an assignment on time, please get in touch with the instructor or the course TA as soon as possible and accommodations will be made for you to turn in your assignment within a reasonable time period. Read more about the requirements for Participation under the Course Policies. Please use the table below to understand how your numeric grade listed on CANVAS relates to your final letter grade in this course. 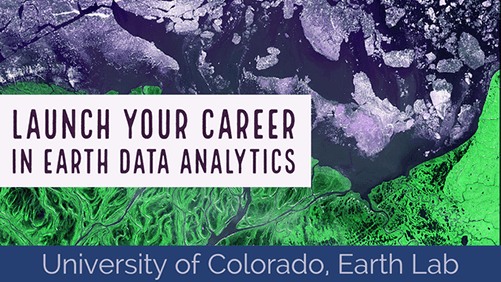 All email messages about this course should include earth-analytics-bootcamp in the subject line and be signed with your full name. Please use your official CU email address when communicating with your course instructors. This semester you will use Piazza for class discussion. Piazza will help you get help faster and more efficiently from classmates and myself. Rather than emailing questions to us, post your questions on Piazza. To get started, be sure to create an account with piazza. You will use this tool on the first day of class, so please do this ahead of time. You will receive an invitation to join Piazza webpage for this course, once you have enrolled and a few days prior to the course begins. Please email the instructor to get access to Piazza if you don’t have it by the first day of class. It is important that you follow the course guidelines when posting to Piazza. In the example above, the fix would be to make sure your function name is correct. Material pertaining to this course will be communicated through the Course Website. Students are expected to check this website daily for assignment and content updates. Attendance is strongly encouraged for all class sessions, though all course materials are posted online. Each week there will be a homework assignments will be due on Fridays and Tuesdays by 8:00 AM (U.S. Mountain Daylight Time). See Grading section for more details on due dates. Use the materials on the course website including the daily exercises, readings, tutorials and links to other resources in addition to skills and concepts that you learn in class to complete the assignment. The instructions to submit each assignment will be included in the assignment instructions. Assignments that you complete will provide you with the skills and resources needed to complete the final project. The final project is due by Sunday, August 26th at 8:00 AM (U.S. Mountain Daylight Time).